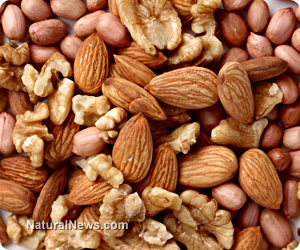 (NaturalNews) Vitamin E is a fat-soluble vitamin that can slow aging and help grow hair. Research has shown that vitamin E can soften the red blood cells, which increases circulation by improving blood flow. Vitamin E comes in eight forms. Four are tocopherols and four are tocotrienoils. Most Americans' diet is rich in gamma-tocopherols while the Europeans' is high in alpha tocopherols. Adding nuts to the diet is a great way to get more vitamin E, as nuts contain high amounts of this valuable nutrient. Cell membranes become less flexible as we get older. When the red blood cells become stiff, they have a difficulty time getting through the small capillaries. The smallest capillaries are usually too small for the red blood cells to pass through without flexing, so when they become stiff, they can't get through at all. This causes a decrease in circulation to the extremities, and into the organs. Within five days of adding vitamin E as gamma-tocopherols, the cell lining of the blood vessels improved as reported in the Journal of Nutrtitional Biochemistry. The study also demonstrated that vitamin E reduced a marker of oxidative stress called or MDA. In the study, men were given 500 mg of gamma-tocopherol, 60 mg of alpha-tocopherol, 170 mg of delta tocopherol, and nine mg of beta-tocopherol. Those with Alzheimer's disease had lower levers of vitamin E and also showed damage from lack of vitamin E. This was noted by tracing the markers alph-tocopherylquinone, and 5-nitro-gamma-tocopherol. The research concluded that a low level of vitamin E in the blood was a precursor to Alzheimer's and dementia. This study used only alpha-tocopherol, while noting that using only this form of vitamin E could lead to increased stroke risk. Supplements with only this type of alph-tocopherol may prevent absorption or bioavailability of other forms of the nutrient. The authors of the study suggest a balance of vitamin E forms to protect the nervous system. Vitamin E can also help regrow hair after hair loss. The nutrient stimulates the growth of capillaries on the scalp. Vitamin E capsules can be applied to the scalp or taken as supplements. To grow hair, it's best to apply topically and take vitamin E internally. Good effects will also be seen on the skin from adding this fat soluble nutrient. Using 1,800 IE of vitamin E per day, diabetic patients showed improvement in both their kidney function and retinal blood flow. The use of vitamin E prevented diabetic neuropathy in those with Type I diabetes. The nutrient has no effect on blood sugar level, making it a good treatment for hyperglycemia. Vitamin E can be found in many foods. Eggs raised naturally are a good source, as are nuts. Sunflower seeds are a great source of vitamin E, containing over 36 mg per 100 grams. Almonds contain 26 mg per 100 grams, and pine nuts have nine grams. Olives add 3.8 grams per 1,000 grams, which is about the same as spinach. Add a little bit of paprika or red chili powder to increase the vitamin E content. Both spices have 30 mg per 100 gram serving, which is a bit more than two milligrams per teaspoon.